We had received a Facebook email response from the Culver City Sister City Committee regarding our campaign. 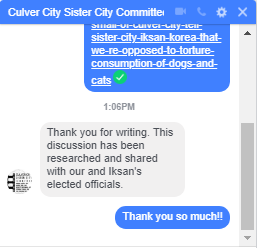 We asked Culver City, California to take action against the dog meat trade in Iksan, South Korea, their Sister city. We are grateful to the Culver City Sister City Committee for responding to our concerns so quickly, and their support for our campaign. They informed us that, “This discussion has been researched and shared with our’s and Iksan’s elected officials.” We hope that the mayor and the city council members of Culver City will have compassion for these poor animals, speak out against the horrible cruelty, and urge Iksan to enforce the law and close down the illegal dog meat industry. We are especially grateful to the Korean activists (Mr. Im and his team) who had walked across South Korea, documenting and exposing the shameful, hidden secret of South Korea which includes the below video of a dog farm/slaughterhouse in Ilkan. This video, we are certain, has helped to gain the attention of Culver City, which brought about this action by the Culver City Sister City Committee. Mr. Im and his team literally risked their own safety to fight for these animals. We stand with you in solidarity! Please sign petition: Iksan, South Korea, Shut down the illegal dog meat farms, slaughterhouses and markets.